For this banjo, I sourced a beautifully figured plank of flat sawn maple from central PA (there are still two banjos worth left). After working with Black Locust, the hard maple cut like butter with carving tools and on the lathe! The integral tone ring is Black Locust. This banjo will be heading back to the shop in a little while. I made an oops in finishing the end grain of the head stock, leaving a couple of unsightly chips at the top edge. And also, as beautiful as the figure is in this plank, there is some graying in the center grain. It doesn’t show in the side grain of the neck, but the end grain on the back and end of the headstock have an unattractive dirty look. 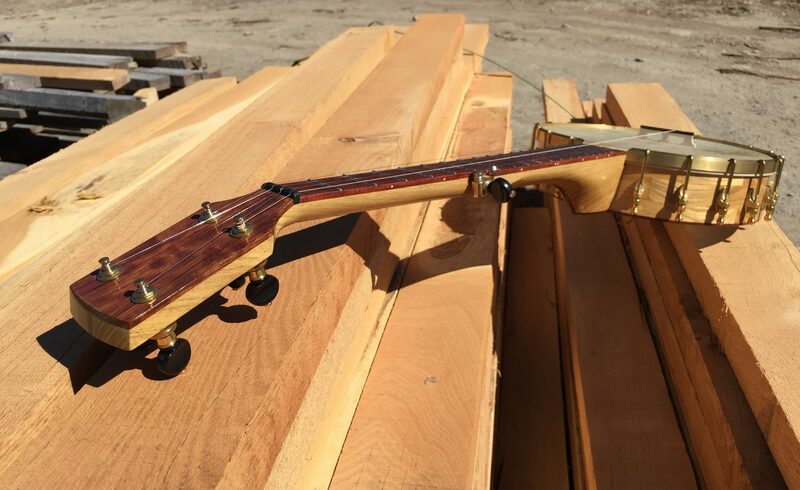 To date, all of my banjos have been finished without stain… just letting the beauty and color of the wood show through. This re-work will be my first foray into staining! Should be fun! This banjo is living its life with a new owner in Catharine, NY! Black Locust is considered to be a “weed” by many. It grows quickly and tenaciously in difficult environments. It is stiff, and hard. Very hard. It is also very beautiful, with a finely textured grain and beautiful yellow/gold color. It was my choice for the primary wood in banjo #2. The entire pot and neck are made of Black Locust. It’s fairly heavy and very stiff. With its initial set-up, the tone was a bit on the bright/tiny side. It’s since been back to the shop for some very fun modifications that I’ll write about soon! This banjo was my first banjo project. It is made from a single plank of wormy chestnut salvaged from a renovation project of my old farm house 25 years ago, and the fingerboard and laminates are black locust from the trimmings pile at a black locust sawmill just up the road. It was a lesson for me in many ways; planning, patience, and precision. When it came to carving the neck and finishing the headstock, I discovered that the worm boring damage was much more severe at that end of the plank, leaving only enough wood for an exceptionally slender headstock. I could have worked around the blackened nail holes in the pot that used to be the homes for hand forged square nails. But I like the visual reminder of history, life, and afterlife of this Chestnut tree. I still enjoy playing this sweet little banjo, and it is a comforting reminder to me of how far my banjos have come.